Buddhism has contributed to the formation of national identity, personality, architecture, and shaped the beliefs as well as the faces of Burmese society. The country with millions of temple towers obviously has several million Buddhas. 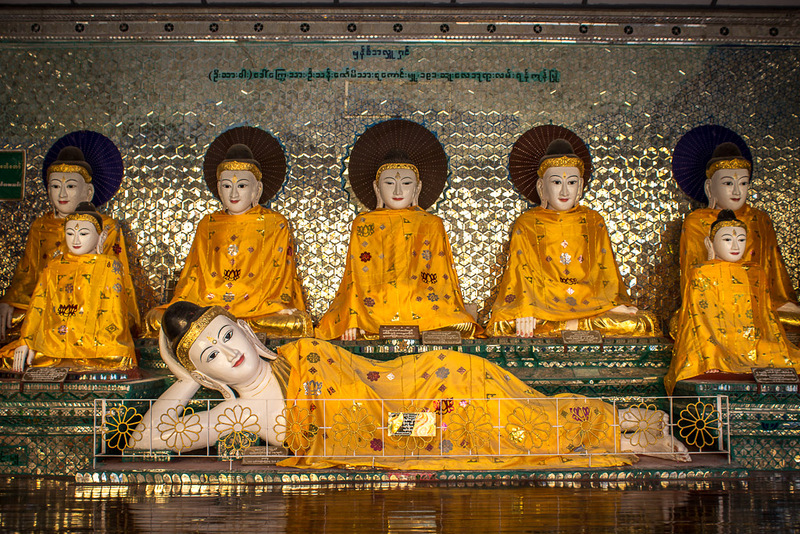 During your trip to Burma, you will have the opportunity to admire a large number of special statues that describe the symbols of Buddhist philosophy, the life of the Buddha and other Buddhas. But when you travel to Myanmar, you will find out that some statues of Buddhas have characteristics that are not found anywhere else. It is a national symbol. The pagoda is considered the oldest one in Myanmar, built more than 2,600 years ago. The temple has four treasures of Buddha. These are the Buddha Kakusandha’s stick, the Konagamana Buddha’s water filters, a piece of Kassapa Buddha’s cloth and eight Gautama Buddha’ hairs. Shwe- means “gold” and -Dagon is the ancient name of Yangon. In this temple, there is a very valuable jade statue, which was rejected by the people of Myanmar. Therefore, this statue is called "the rejection of Buddha". The main reason is that this statue was offered by the general of a military group. The face of the statue resembles the face of this general! Near the Shwedagon Pagoda, people can see the temple of Chaukhtatgyi Paya with a giant Buddha lying down. This Buddha statue is special because the eyes of Buddha are looking down. The eyes are green and bright; therefore, the statue was named Green-eyed Buddha. Indeed, the Buddha's eyes are made of crystal from the most famous crystal-making company in Myanmar. Ngadatkyi Paya pagoda also has one of the most famous special statues of sitting Buddha. One particular thing about this statue is that it is clothed in gold, with epaulettes and shields covered with gold. It seems that the Buddha also wears a golden armor. In tours in Myanmar organized by travel agencies, tours of the pagodas are on the program. Through these visits, visitors can better understand the Burmese culture as well as the cult life of Burmese people. Protecting ancient Buddha statues of Burma also means preserving some of the cultural wealth of the world.